Oh my word the girls love this one. Perfect for their new twin beds, colors match perfectly and they are light not to thick for this time of the year. All items arrived in good shape. 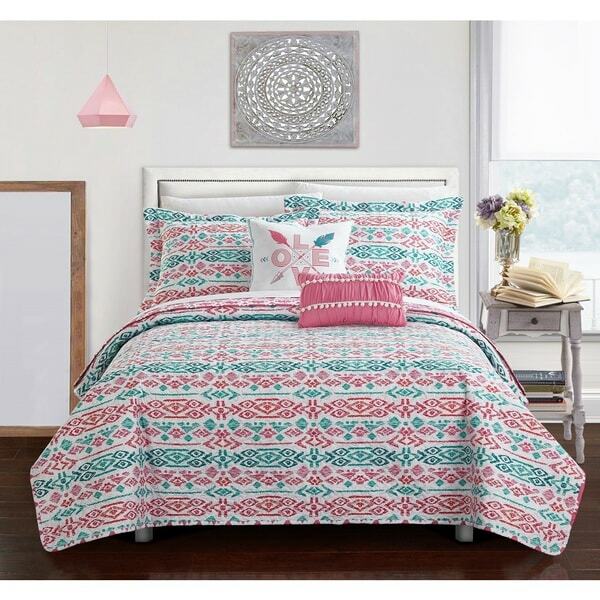 The bohemian inspired Chic Home Dai Pink Reversible 5-Piece Quilt Set featuring an ikat pattern includes everything you need to perfect that Boho Chic look. Bright and fun colors in aqua and rose tones make this the perfect bedroom decor. Trendy boho 'Love' pillow as well as a ruffled pom pom fringed pillow complete this amazing look.